One of our main aims that we set out for this year was to get out there and try as many new and exciting things as we could. We just love adventures and adrenaline rushes and have also succeeded so far to get out climbing much more. 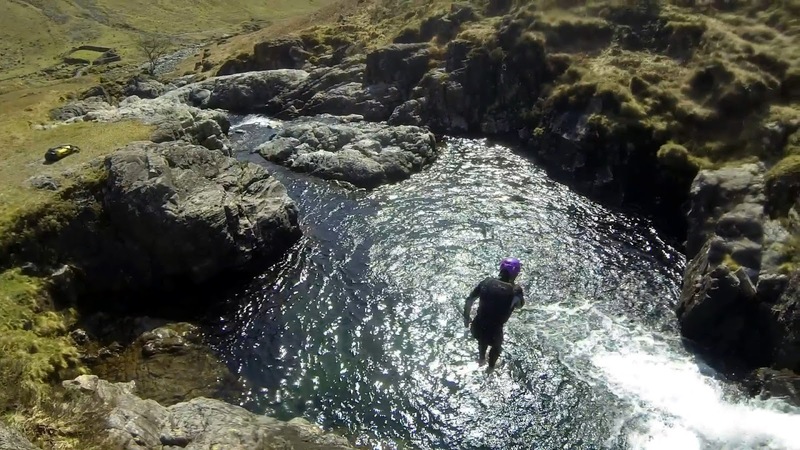 We got the chance to head up to the Lake District with a good friend and do some “Canyoning”…and boy did we pick an amazing day for it! 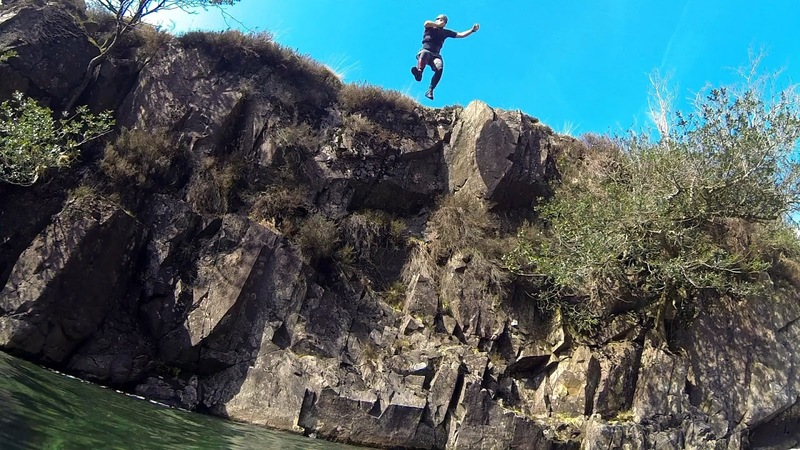 On the hottest day of the year so far we jumped into the crystal clear waters of the River Esk! If you follow us on our Facebook page you might have noticed a month or so ago we announced our plans to visit Switzerland this year… separately! Don’t worry, the Roaming Renegades are still going strong but Shorty has been invited to a friend’s stag party which will involve heading over to Interlaken to do some Canyoning and most likely heavy drinking… hopefully not at the same time! 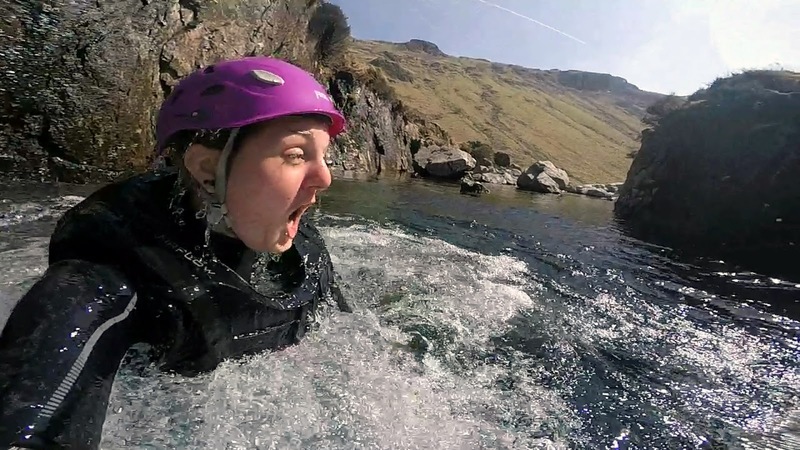 Well, I solved one problem by booking myself flights to Switzerland, then we got in contact with Lee (Who is the one getting married) and organised a day out together canyoning in the Lake District. This served two purposes really, one was for me so I could have a go and also as the route in Interlaken will be more demanding, Shorty wanted to get antiquated with the techniques before he went! OK, so it’s not quite Interlaken but here in the Lake District and along the river Esk we found one of the most amazing and picturesque spots in the UK. The water is as clear as I have ever seen it which makes it an even more incredible experience. Hopefully we will get chance to go out again this year as we really did find something else that we totally enjoy the challenge of alongside our love of climbing and mountaineering. It would also be awesome to go canyoning whilst travelling and is just one more reason why we feel New Zealand with it’s outdoor lifestyle is the place we will eventually settle down in. Being climbers, adventurers and explorers this sort of thing is what we really love doing. We said early on this year that as I had finished my MA and had more time, as well as a looming knee operation at the end of the year that we would make every effort to get out and not only climb more but to try new things when ever we can. 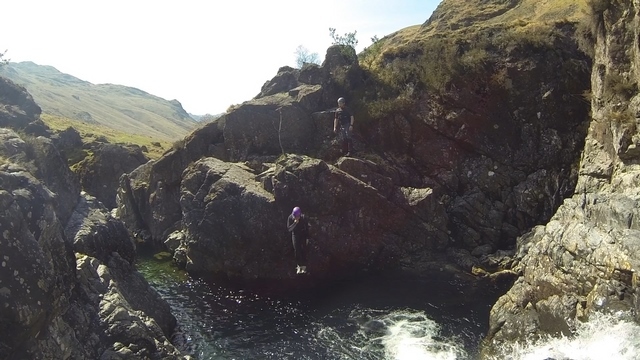 Kayaking is next on the list and we also recently did some more abseiling! So, canyoning, what exactly is it? Well it’s quite a few things really. Often it involves making your way down a canyon whether that be a river or a dry desert crevasse. 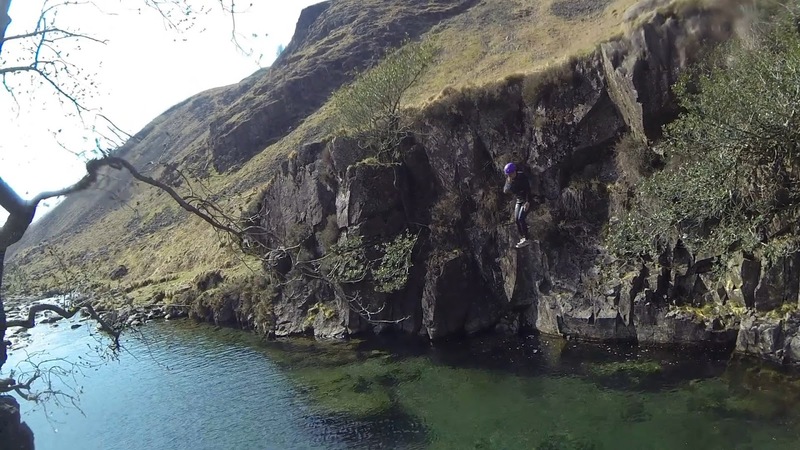 You walk, jump, abseil, climb and sometimes swim your way down the route. Other times it is just about jumping from high and challenging points on the canyon edge/ river banks into deep carved pools at the bottom. This is what we concentrated our day on as we are quite well acquainted with the other aspects and found this to be the most fun element!! To dampen my mother’s fears however I will also add that there is a big difference between going canyoning and just a bunch of kids jumping into rivers!! Here we have wet suits, buoyancy aids and helmets. We have researched the routes and the spots where the water is deep enough to jump. We also have someone with us with years of experience in how to jump, land and what techniques are safe for shallower water. As is the case with us this trip is a little different to the ones you might see on other blogs. We don’t tend to do organised tours or trips where we can. We don’t go climbing, mountaineering, abseiling or caving through an organisation, we just go and do it. We are lucky that through climbing we know lots of people with the knowledge and equipment to do that and appreciate many others don’t have that option. For us it is just as safe, but twice the adventure! But if you want to give any of these things a go and don’t have the benefit of climbing experience or other contacts then a group can also be great fun! But for us part of the enjoyment is of overcoming your fears, the environment and the challenges you face with your own skills and direction. We woke up bright and early on this Wednesday morning… this time fortunately not for work which meant that even though we were up earlier than usual, to catch the first train, we had a spring in our step! The sun was shining and the heat radiating off the train platform as we waited amongst the commuters with our gear hastily packed into our bags and clearly on show. As we squeezed onto the train we got the sort of looks that said “I hate the fact that I am stuck in an office on this glorious day and I know you are off on an adventure”… this is what seizing the day is all about! Meeting up in Manchester city centre with Lee we battled through the rush hour traffic before hitting the open motorway straight up to the Lake District in just over an hour. If you have never visited this region you are really missing out, not only does it have England’s highest mountain: Scafell pike, but a myriad of other mountains, crags, lakes and rivers to explore as well as tiny chocolate box towns and villages scattered in-between. One in the Lake District we headed though Windermere and towards the infamous “Hard knott pass”, a steep and winding one lane pass through the mountainside which at first glance seems nowhere near suitable for a car! One the other side was our destination, the river Esk! As we made the 40 minute uphill trek (in our wetsuits!) we finally caught sight of the beautiful river, the sun sparkling off it’s crystal clear waters we couldn’t wait to get started!! We started low down the river and would make our way up higher and higher and hopefully onto more challenging jumps. The first however was still a good 5 foot high which included dodging a few rocks! Wetsuits ready and the sun beating down we were ready to finally jump in, the heat had somewhat distracted us from the reality of just how cold the water would be! That first jump really took our breath away to the point in which we couldn’t talk! It was like jumping from a sauna into an ice bath! 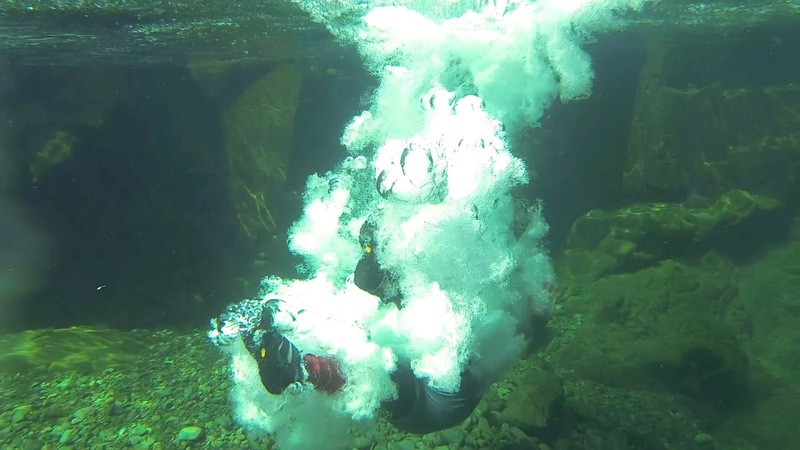 As the day went on and we jumped more and more the wetsuits really came into their own, by our third jump we could hardly feel the water temperature at all and were completely loving it! 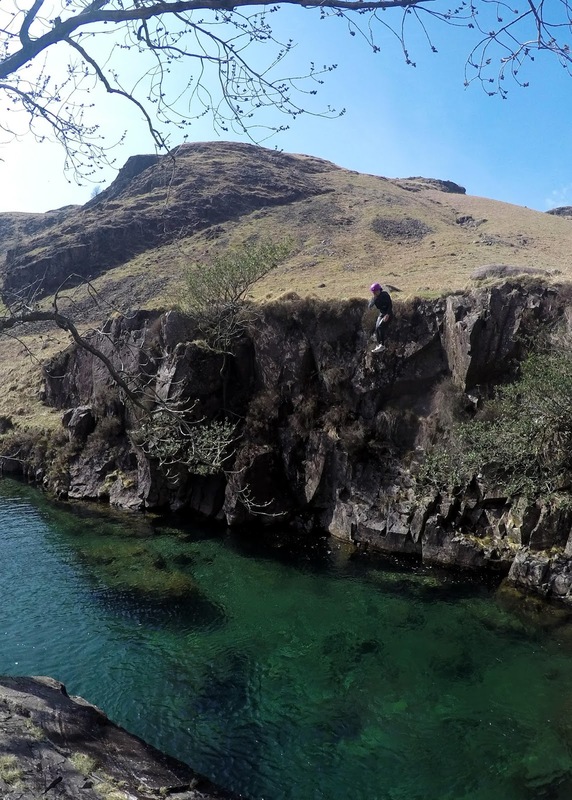 We started to challenge ourselves more with jumps into smaller pools, over jutting out rocks, on top of high buttresses and even somersaults, gaining more and more confidence as we progressed! The day just seemed to fly by and ever jump we eventually conquered felt like a real achievement. By the end much of that initial fear had gone and as our techniques improved jumping and landing comfortably in the water felt like second nature. As we headed back down the river towards the car there was one more challenge Lee had for us. Across from the first jump we had done was a huge cliff face we had initially laughed off as something we could maybe try in the future when we had come out canyoning quite a few times more. 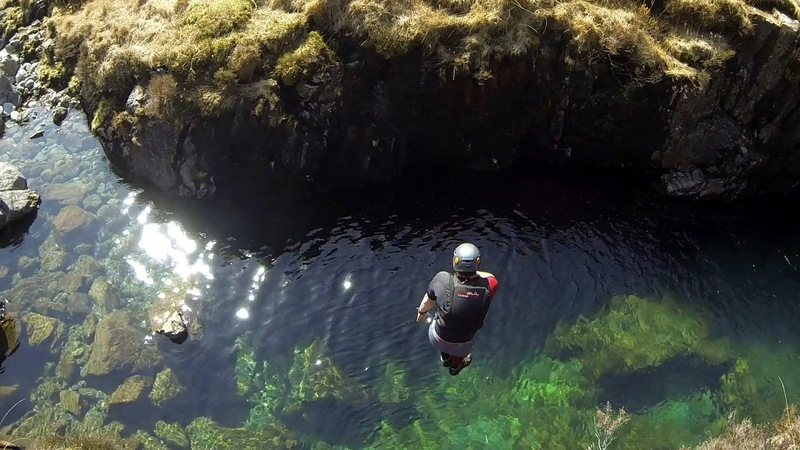 It was a good 25ft high drop into a quite shallow pool below and as we had found out throughout the day, many of these jumps look even bigger and more intimidating when you stand at the top! We jumped into the water from that first jump, now like it was nothing, and swam over to the opposite side to have a look at the jump. We were both determined to head home on a high and push ourselves to do our biggest jump. Standing at the top and looking down to the rocky river bottom below the nerves came back once again! Fortunately the area at the top of the jump was flat and stable… no excuses! This was it! …and we did it and it felt amazing! So much so we swam around and did it again straight after! What a day! Reflecting on one of our most amazing adventures! Wow!! Why didn’t we do this earlier! Who knows, but what we do know is that we will be doing it again. Now I am even more jealous I can’t go and do it in Interlaken, but I know Shorty will have an amazing time too and am glad of the opportunity to give it a go! We will get out again to some amazing spots in the British countryside and hopefully do some higher and even more challenging jumps next time too. Not only that but it has been added to the list of things we want to do whilst on our round the world trip… so we are off researching! To be honest the fact that we loved canyoning comes as no surprise to us, we love all this adventurous, but we really did fall in love with it and haven’t stopped thinking about our next trip out since! Next time Lee is back in the UK we will be back in the wetsuits!… guess we will just have to make do with climbing up mountains in the mean time! 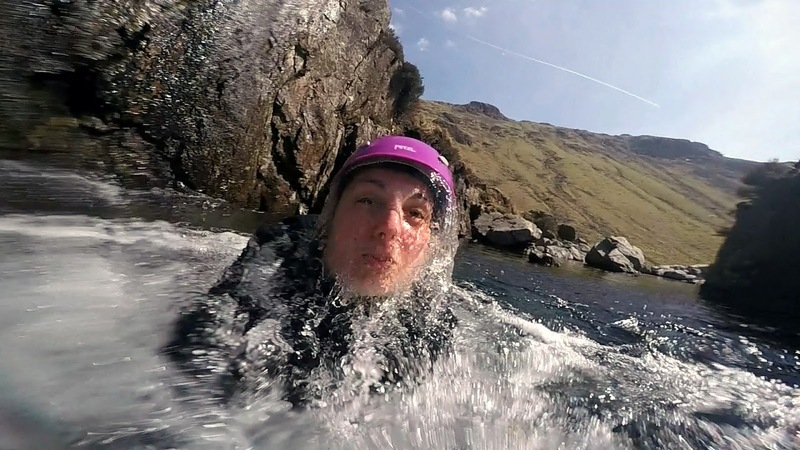 Hower, if canyoning isn’t quite your thing then there is no need to worry, the Lake District National Park has so much variety to offer from conquring huge peaks to gentle walks through wonderful countryside. It really is a place for everyone! 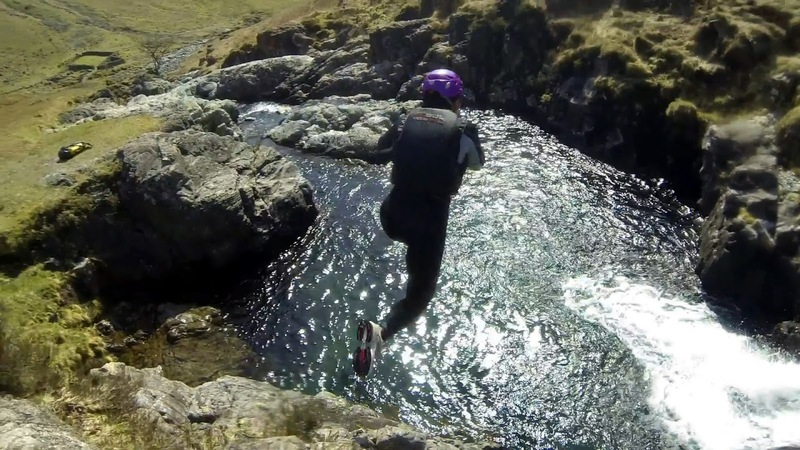 Have you ever given Canyoning a go or would you? The deafening silence of Auschwitz…A Black and White film photo essay.